If you would have told the average Colorado Rockies fan that they would hold the Washington Nationals to only one run in each of their first two games on the current road trip, you may have been rightly greeted with an eye roll. But it happened last night, and despite Kyle Freeland’s wobbly, labored start that saw him leave the game after only 4 2/3 innings and 101 pitches — it somehow happened again. 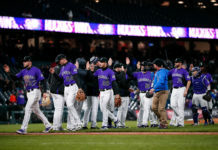 On Thursday night, second baseman DJ LeMahieu provided the power with a pair of home runs and four of the Rockies’ five runs driven in, and on Friday, it was Carlos Gonzalez’s turn. 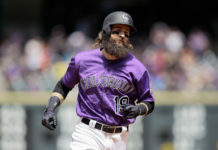 The right fielder had a home run and drove in the Rockies’ only two runs of the game — and the Rockies’ high-priced bullpen made the lead stand up for the second night in a row. 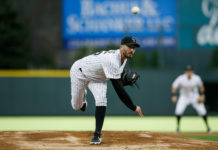 Scott Oberg, the spark that ignited the fire that consumed the Padres and Rockies on Wednesday, leading to a five-game suspension for Nolan Arenado and a four-gamer for Gerardo Parra, ended up with the win after following Freeland for 1 1/3 innings in which he allowed only one baserunner on a walk. Arenado and Parra, who are appealing their suspensions, both played on Friday, but it was that bullpen that made the difference. Bryan Shaw followed Oberg with a perfect inning and two strikeouts. Mike Dunn followed him, getting Bryce Harper out — the one batter he was called in to face. 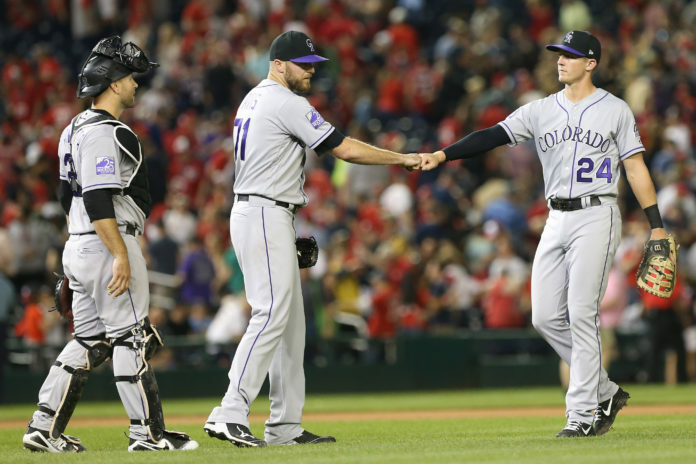 Adam Ottavino came next, unleashing a filthy slider that danced and darted past the Nationals’ bats, striking out the two men he faced before closer Wade Davis slammed the door for his sixth save in the Rockies’ eight wins this season. The Rockies bullpen didn’t allow a single hit, and only Oberg’s walk allowed any National to even reach base after Freeland departed. Harper, who is 0-for-7 with three strikeouts in the first two games, has been indicative of the Nationals’ offense, which has been completely stonewalled by the Rockies’ relievers. The Rockies, now 8-7 on the young season, will have taller hills to climb over the weekend. On Saturday, Jon Gray — who allowed 10 hits in his last start — takes the mound for the Rockies against Max Scherzer, who was last seen tossing a two-hit shutout over the Atlanta Braves on Monday.